The English capital is bursting at the seams with places to satisfy any worldly foodie’s bucket list. Home to Michelin star restos, pub fare fit for a king, and creatively designed spaces for getting your fill, there’s something for everyone in London when it comes to the fine art of eating. Feast your eyes on this diverse list of the best places to eat in London, England. Whether you’re looking for classic British fare or a smorgasbord of multicultural dishes, London is the place to expand your palette and find your new favourite dish. Here are some of the top spots. No place quite offers a proper English meal in London like an old boutique inn gastropub does. The Fox and Anchor is one of Farringdon’s old-time favourites and the food is mouth-watering. 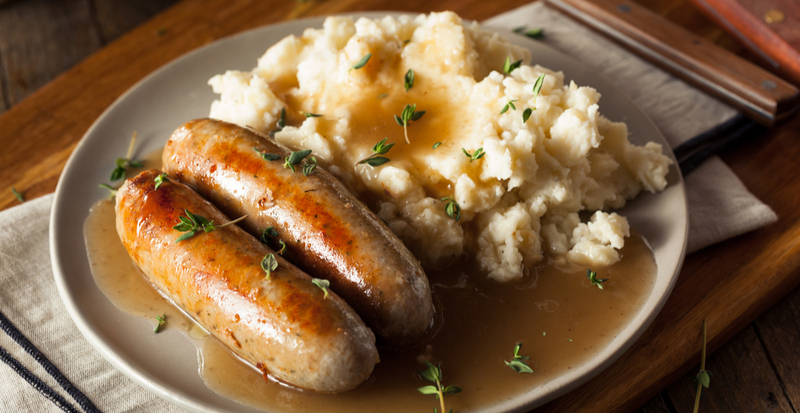 We recommend you try the “toad in the hole”, an English tradition (think upscale bangers and mash) that is unforgettable when you have it in the right place. This place is it. London is home to over 50 Michelin starred restaurants, but this one is more accessible because you can get a 5-course shortened tasting menu during the week (lunch also), which won’t set you as far back. Expect modern British dishes of fine, often overlooked ingredients in a relaxed setting. Nowhere close to being reminiscent of a Hutong, this upscale Chinese restaurant serves up epic dim sum with breathtaking views of the London skyline. Situated on the 33rd floor of the famous glass Shard, it’s a great excuse to dine in metropolitan style. While it’s probably not the best Chinese food you can get in the city, it’s definitely worth the view and atmosphere of high-end dining (get it, high end? 😉). Fantastic spot for seafood, served fresh by their onsite fishmonger. Oysters and bubbly, anyone? It’s not every day that you can expect to find such fine foods at a food court in a department store, but in London this is fair game. Harrods food hall boasts some of the freshest ‘deli’ items (‘deli’ stands for delicate/delectable, right?). Start at one end with a glass of wine and half a dozen shucks at Caviar House oyster bar, move on to sample the fresh meat pies and sausages from local butchers, and complete your food coma with some delectable macarons and marzipan treats from the bakery section. While it’ll cost you as much as a meal at a sit-down restaurant, the vibrant bright hall is not your average supermarket and the atmosphere is not to be missed. If you’re lucky enough to catch yourself in London on a Sunday, make time on your “shed-yule” for this old British favourite. While it’s a hefty, filling meal, it’s usually taken much earlier than you expect: at lunch. Mouthwatering rare beef from the carvery, potato mash, and all the veggie fixings, along with a proper Yorkshire pudding and gravy – yes, please! This Bombay-inspired cafe restaurant is the talk of the town when it comes to good Indian food. There are a few locations, though Shoreditch is a local fave. The waits are long if you don’t have a reservation, but once you’re seated, you best be ready. Come with friends so you can go sharesies on everything and don’t you dare miss out on their cocktails, or as Londoners like to call ’em, ‘bevvies’. You can’t leave Londontown without a proper go at a traditional chippy. Head to this Marylebone spot (it’s been there for a hundred years) where you can expect large portions of fish and chips (i.e. fries) and anything fresh served on ice. Plus it’s BYOB so you can wash it all down on the cheap. This place will up all standards when it comes to high tea. Offering far more than just tea service, this luxurious Mayfair spot dates back to 1921 and offers an atmosphere where British heritage meets European grandeur. Comprised of individual cakes and pastries such as Victoria sponges, sherry trifles and strawberry tarts, every high tea comes with fresh scones with homemade jam & clotted cream and an assortment of finger sandwiches. Plus, a little-known secret: It’s “all you can eat” (most people don’t know this) so although it’s dainty, you won’t leave hungry. Once you’ve emptied all the plates, just ask for another helping; it’s all included in the listed price. Sometimes a girl just needs a table outside, a lavender backdrop, a glass of vino and an appie served up all delicious and cute. Aubaine is delivering on all Instagram goals and their Marylebone location – with its courtyard patio – is an excellent choice for this. Brunch, lunch, dinner, or a sugar rush, this French bistro will please. You wouldn’t expect to find the best salt-beef bagels in one of London’s original Bangladeshi neighbourhoods, but there you have it. A popular late-night spot for cheap eats (it’s open 24 hours), it’s better to go during the day as you won’t have to fight the crowds when the nightclubs let out. They also have fantastic baked goods. Situated in one of London’s oldest neighbourhoods, Hampstead Heath, you can find one of London’s oldest pubs, once frequented by England’s well-known literati. Wood panelling and uneven floors attest to its elegant age, and its fine traditional English fare served with a pint of King Lear (that’s Cockney for beer), make the Spaniards Inn a must-see – especially on Sundays when the ambiance is superb with patrons lazily day-drinking and gabbing over their roasts. Skip Pret and Valerie and pool your pounds for the most delicious éclair you’ll eat outside of Paris. Three-Michelin-star chef Joakim Prat bakes them fresh every morning and they’re so beautifully decorated you’ll almost want to resist sinking your teeth through the smooth chocolate shell… we said almost. There are two locations in London, but opt for the fancier Kensington locale. How do you get the most bang for your buck on vacation? AYCE restaurants, of course! This Indian buffet is bursting at the seams with yummy, vegetarian goodness. The best part: you can eat to your heart’s content for only £8! Located just one tube stop away from King’s Cross St Pancras station, this is one spot you won’t want to miss. This is your one-stop shop (er, restaurant) for gourmet German sausages. Customize your currywurst with toppings and heat preference (from “not” to “ringer”), and add schnitzel if you’re feeling fancy. And don’t worry, vegan friends — there are options for you too! Lots of locations, but we like the Fitzrovia one. This pink paradise is one of the most Instagrammable cafés in London. Everything about this cake parlour is right out of a flowery, pink dream! Stop by for a slice of their famous cake, or maybe a cupcake or two (or three, or four). No trip to London would be complete without taking in a full English breakfast. A classic fry-up will include bacon, sausage, eggs, toast, and likely baked beans and fried tomatoes. The Regency Café is one of the more popular breakfast joints in the city (probably best left for a weekday visit), but is well worth the wait any day. Okay, we could go on, but now do you believe us that London is enough to satisfy your hunger and then some? Time to stop reading and start eating. Got the travel bug and want to contribute to Mapped? Contact us at [email protected]. Content Manager at Daily Hive who sometimes manages to also write some things!